The Canon PowerShot A4000 IS is a 16MP camera that sits at the top of Canon's A-series of affordable, beginner-level compacts. And It really is a compact camera: viewed from the front, the Canon A4000 is not much bigger than a credit card. It's only around 24mm deep too, but still manages to squeeze in an 8x optical zoom with an equivalent focal range of 28-224mm. Coming from Canon's PowerShot line, the A4000 IS favours functionality over fashion - although you could be forgiven for missing that detail at first glance. 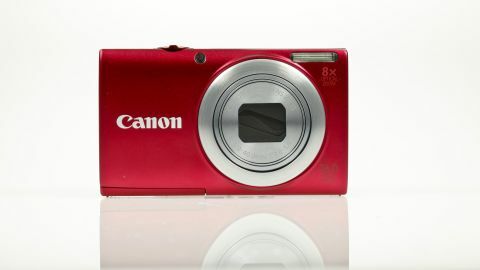 The A4000's minimalist metal body certainly wouldn't look out of place in Canon's more stylish range of IXUS point-and-shooters. A 3-inch 230k-dot screen swallows up much of the rear of the Canon PowerShot A4000 IS, with a set of small control buttons dotted down its right-hand side. There are no dials here - just push-button controls - which could potentially make it slower to move between settings and make adjustments. However, there is at least a one-touch movie button for instantly recording HD video. The Canon PowerShot A4000 IS shoots 720p at 25fps, with full-time Intelligent Image Stabilisation to help kill camera wobbles and keep footage smooth. Newcomers to digital photography will no doubt appreciate the level of hand-holding the Canon PowerShot A4000 IS offers. The Intelligent IS system automatically adjusts the optical Image Stabilizer between six different modes in order to reduce blur. There's also a dedicated Help button, plus a Smart Auto exposure mode that analyses the scene you're shooting and selects one of 32 different camera set-ups accordingly. In a further nod to keeping it simple, the Canon A4000 IS comes with Live View Control. This mode doesn't dirty itself with talk of 'apertures' and 'white balance', but distills camera control into three simple on-screen sliders for brightness, colour and tone. While it isn't exactly bristling with semi-automatic and manual exposure modes - Program mode is the closest you'll get - the Canon A4000 does at least enable you to set a custom White Balance and adjust exposure compensation up to +/- 2 EV in 1/3 stop increments. Elsewhere, the Canon A4000 IS's Face Detection system can pick out 35 faces in a scene and adjust focus and exposure appropriately, while Face Detection White Balance automatically optimises the colour for accurate skin tones. Further highlights on the compact camera - priced at £169 in the UK and $199.99 in the US - include a Macro mode that can focus as close as 1cm, and six creative modes. These include Miniature, Monochrome and retro Poster Effects that can be applied to HD movies as well as stills.